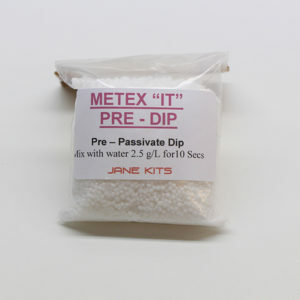 Jane Kits also has two products that are used as activators. These are called METEX M and METEX IT. Both of these activators are acid salts that are mixed with water and used in various metal activations, prior to plating or passivating. 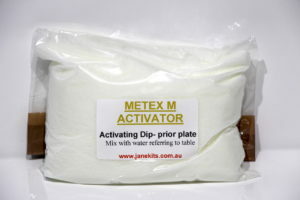 METEX M is a water-soluble dry acid salt, which is a balanced mixture of acid salts, activators and surface active agents Your parts have to be completely clean prior to this activation and is a process done immediately prior to plating. After immersion in the Metex M solution a clean water rinse is required before placing into bath. Metex M acid salts dissolved in water are recommended as an activating dip prior to electroplating the following basis metals: steel, copper, brass, cast iron, beryllium copper, aluminium, malleable iron, zinc alloy diecastings, stainless steel, lead alloys, nickel silver and pewter. 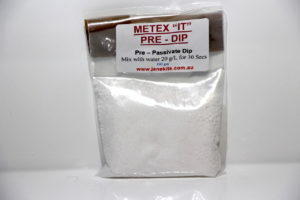 METEX IT is a dry acid material used in water to chemically polish and brighten zinc plate. It can be used as a final finish on zinc plated stock and is a replacement for nitric acid pre-dip before passivating. It will not only improve the appearance of the passivate, but will lengthen the life of the operating solution.